We are a church for the whole community, if you haven’t been to church for a while or perhaps have never been through our doors you are most welcome and are invited with open arms to come and share with us on a Sunday morning at 11:30am. It doesn’t matter what you wear or where you sit, come just as you are, the service usually lasts about an hour and often folks stay behind for a chat afterwards. There are also lots of other opportunities to share and get involved, at all our events you will find a warm greeting and love in the name of Jesus. At Warrenpoint Presbyterian you will find a place that seeks to be a traditional church, being faithful to our past, yet you will also find a place that is open and forward thinking. Desiring the best of old and the best of new in our service of the Lord. Warrenpoint Presbyterian Church is a vibrant, open and friendly congregation that seeks to be a witness to the Gospel of the Lord Jesus Christ, to proclaim that Christ died on the cross yet rose from the tomb to save those who would follow him from their sin. This salvation gives a new purpose in life, to live with fulfilment and joy while working together as brothers and sisters in the Lord to honour and glorify God. The Congregation of Warrenpoint was formed prior to 1688, in 1830 the then minister and a minority of the congregation joined the Remonstrant Synod, which later became the Non-Subscribing Presbyterian Church. Those who remained loyal to Reformed faith built the present meeting house in 1831, due to growth in the congregation the meeting house was extended in the early 1880’s, this growth continued until the early years of ‘The Troubles’ in the 1970’s. The meeting house as it is now is an interesting yet simple building, with attractive architecture and beautiful stain glass. There is a very useful multipurpose hall attached to the rear which is used for various events from Youth Club to Knitting Circle. While the congregation has faced decline, it remains a vibrant and warm fellowship that has great hopes for the future, excited about what God is going to do in the lives of its members and the local community. 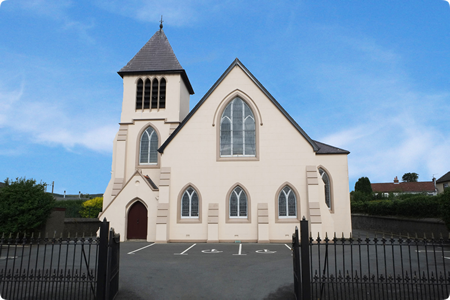 Warrenpoint Presbyterian Church is currently vacant and the convenor is Rev. Stuart Finlay. The ‘Kirk Session’ is the group responsible for the ‘spiritual oversight’ of the congregation, they are known as ‘Ruling Elders’ and they work alongside the minister in leading the church and looking after pastoral concerns. The ‘Congregational Committee’ is the group responsible for the practical issues of church life. Even though their role is not overtly spiritual, members of committee are elected due to their commitment to church attendance and obvious faith. As they look after the resources the church has to do her work, the committee equips and assists the Minister, Kirk Session and congregation for a shared mission. These are elders who after faithful service to God over many years have retired from active service on Session. They remain an integral part of our church life and witness and are much loved by the congregation for their wisdom and experience.